Every day, great bar riddles are told in saloons and drinking holes all around the world. For those who are interested in solving these questions without having to go to a bar, our staff has collected and arranged this huge list. 1. Read every piece of the clue carefully. The clues listed before each question will probably take a minute or two of your time to examine carefully. 2. Apply these clues to think about the solution but remember to think both logically and outside of the box. 3. Propose an answer, and then check it against the given answer. 4. Share with any friends or bar mates that you know would enjoy them. Good luck with these entertaining brain teasers! Hint: Why would the man want a glass of water? The man had the hiccups and wanted a glass of water to help get rid of them. The bartender could hear the hiccups when the man spoke, so he brought the gun out to scare the hiccups away. It worked and the man thanked him and left, no longer needing the glass of water. You are in a bar having a drink with an old friend when he proposes a wager. "Want to play a game?" he asks. "Sure, why not?" you reply. "Ok, here's how it works. You choose three possible outcomes of a coin toss, either HHH, TTT, HHT or whatever. I will do likewise. I will then start flipping the coin continuously until either one of our combinations comes up. The person whose combination comes up first is the winner. And to prove I'm not the cheating little weasel you're always making me out to be, I'll even let you go first so you have more combinations to choose from. So how about it? Is $10.00 a fair bet?" You know that your friend is a skilled trickster and usually has a trick or two up his sleeve but maybe he's being honest this time. Maybe this is a fair bet. While you try and think of which combination is most likely to come up first, you suddenly hit upon a strategy which will be immensely beneficial to you. What is it? Hint: Think what would be most likely to happen if you chose HHH, would this be a good decision? The answer is to let your friend go first. This puzzle is based on an old game/scam called Penny Ante. No matter what you picked, your friend would be able to come up with a combination which would be more likely to beat yours. For example, if you were to choose HHH, then unless HHH was the first combination to come up you would eventually lose since as soon as a Tails came up, the combination THH would inevitably come up before HHH. The basic formula you can use for working out which combination you should choose is as follows. Simply take his combination (eg. HHT) take the last term in his combination, put it at the front (in this case making THH) and your combination will be more likely to come up first. Try it on your friends! What did the bartender say to B flat, E flat, and G flat? What did the man with slab of asphalt under his arm order? What does an alcoholic ghost drink? What do you say when you're gonna drunk dial someone? Where do monkeys go to drink? 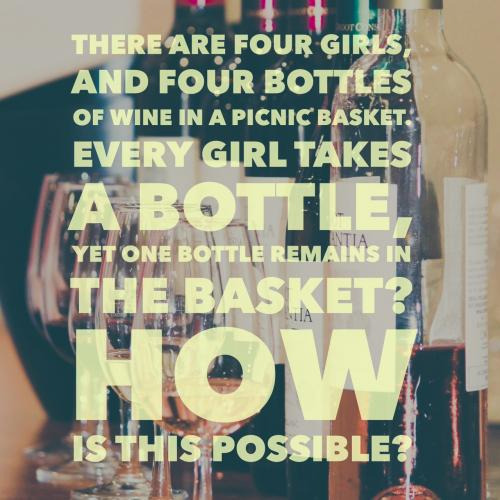 Can you come up with a cool, funny or clever Bar Riddles of your own? Post it below (without the answer) to see if you can stump our users.